The Mega Man series is huge. Not only does the main series have lots of games but also the spin-off series like X and Battle Network have their own sequels as well. The previous entry to the main series Mega Man 8 was released in 1997, and just over 10 years later Capcom decided it was finally time for a sequel, that goes backwards (?). 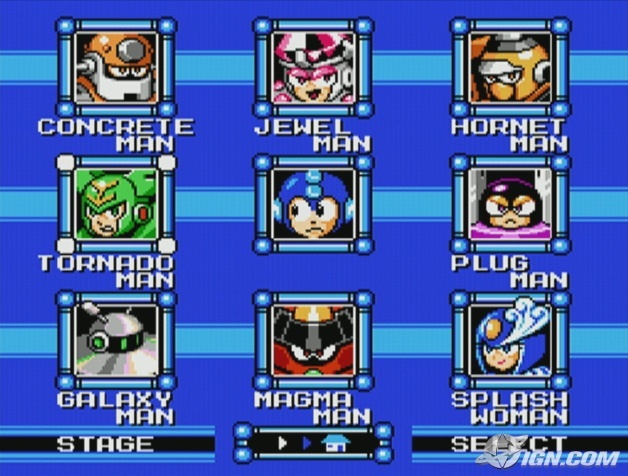 For the game’s story if you’ve played one Mega Man game you’ve played them all. Robots are running rampant through the city and is suspected that Dr Wily is behind this, but shocking developments state that the robots belonged to Dr Light (gee, I wonder who could’ve reprogramed them?). 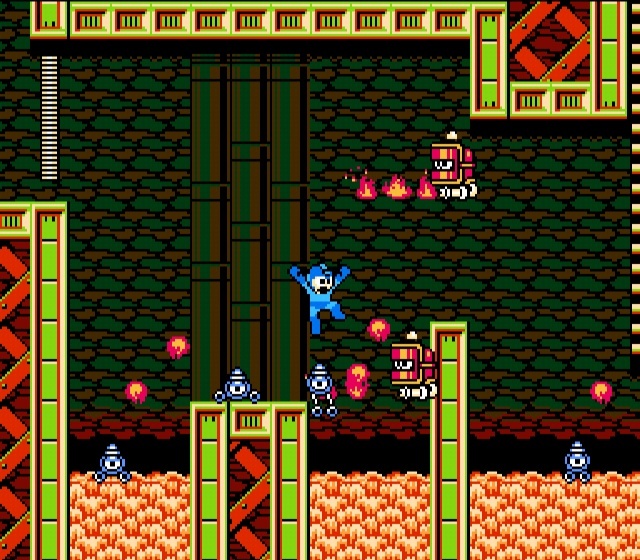 Mega Man then has to set out to stop the robot invasion. The story is kept simple and doesn’t distract from the gameplay too much. The gameplay is also just like the other games before, but that’s not necessarily a bad thing. It involves choosing which stage you want to do, beating that stage’s robot master, copy their powers then use it to conquer the next one. The controls are basic, it’s just move, jump, shoot. Easy right? WRONG! This game much like the previous entries is nails. If you’re not concentrating on your surroundings then you’ll find it’s easy to die. 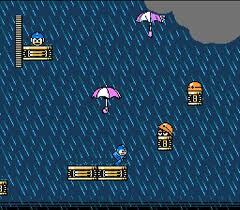 The game also introduces various level gimmicks to spice up the gameplay e.g. weather that alters your jumping. The game is based around trial and error so once you get the levels down and get a basic idea on how the weapons work then it’s not too hard, but expect to die often. The game’s graphics are very different to that of other modern games, and by that I mean it’s made to look like the 8-bit NES games, same sprites and all. There’s even an option to make it look more like an authentic NES game by making the graphics flicker (why you would want that though is a mystery to me). 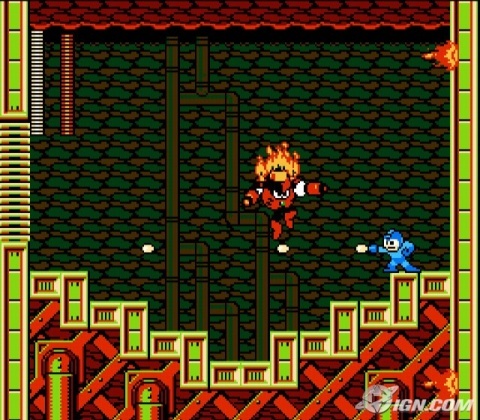 Whilst some may see this as more fan service the graphics have a timeless feel to them, it’s the way Mega Man was meant to be. Much like the graphics the music and sound is done like an NES game with 8-bit tunes and sounds. The classic games on NES were well known for having great music and likewise the tunes here are fast paced and incredibly catchy (the Concrete Man theme is a personal highlight of mine). As this is made to feel like an old game there’s no voice acting, but anyone who has played Mega Man 8 on PS1 will remember the horrendous English voice overs, poor voice acting was like a tradition for Mega Man that carried over into the X series and Mega Man 64, so not having voices isn’t really a bad thing. The game is available on WiiWare, PSN and Xbox Live for £10, which is quite frankly a bargain. If you can overlook the high difficulty factor then you can see both the creativity and love that went into making this game. It looks, sounds and plays like a classic game, has creativity flowing through all it’s levels and it has various challenges and DLC (like Proto Man as a playable character and an extra level) so the game has great lasting appeal. 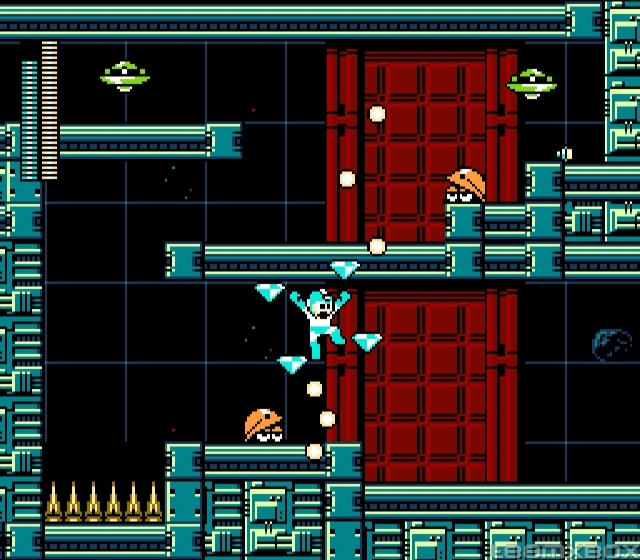 Mega Man 9 is a great game for Mega Man fans in particular, but not for the faint of heart.